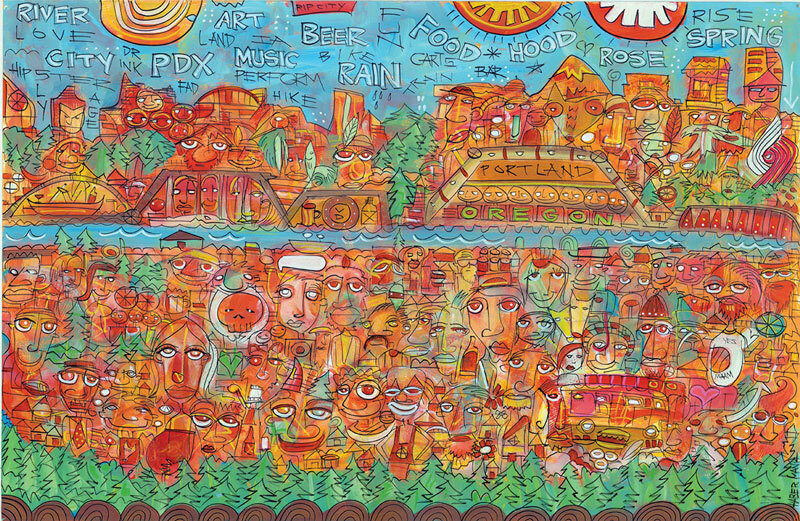 PDX Magazine Art Poster — Chris Haberman, Portland Cityscape. This month, we offer a poster version of this issue’s cover art at our center spread of the print magazine. Our inaugural art poster, a Portland cityscape by one of the most prolific and popular artists working in Portland today, could not be more appropriate. Chris Haberman is a working artist, curator, and writer native to Portland, Oregon. His art is primarily folk-art in nature, composing paintings of people and text, and creating sculpture from found objects. Haberman has created more than 10,000 works of art since 2003. His work has been featured on Oregon Public Broadcasting programs, in Juxtapoz magazine, and in numerous regional and national media sources. In addition to making art, Haberman is a freelance curator, co-founding the People’s Art of Portland Gallery in 2010, and is the current art consultant/curator for the third through fifth season of the Independent Film Channel’s program Portlandia. You can get this 11×17-inch art poster from the print copy of the magazine HERE.